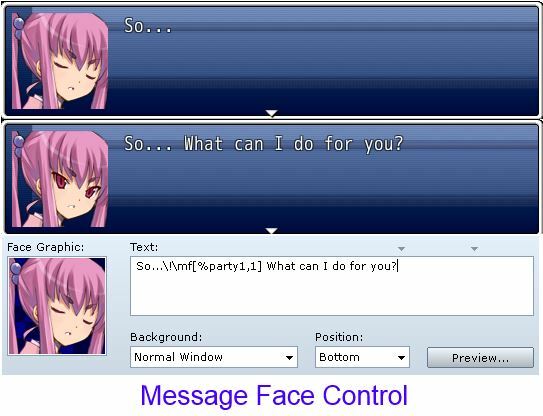 This script provides a message code that allows you to change the face that will be displayed in the message box. This allows you to display different faces in the middle of a message. The message code is customizable so you can choose what code you want to use in case of conflicts with other scripts. This script can be used in conjunction with other scripts that treat certain face names in a special way. For example, you can use Placeholder Graphics to draw faces based on certain actors or party members. To change the face that is shown in the message box. The message code takes a name, which is the name of the face image to use. It also takes an index, which is the index of the face on the image. By default, the code is MF and the delimiter is the comma “,”. In the configuration, you can choose the code and delimiter that you want to use for the message code. The delimiter is what separates the name from the index. The position where text starts is determined when the page begins. This means that if you initially don’t have a face, but will draw faces later on, you should create an empty face image so the game knows that you’re planning to show faces. Would it be possible for you to make this for MV? You can do it using show picture commands, but that would be a lot of event work. Scripts are available that automatically grab the face and choose the appropriate picture to display. what kind face maker did you use? I didn’t. I used graphics from Kaduki’s website. Ooh, this is a cute little thing to add to text boxes.